THIS HOTEL IS 100PCT NON SMOKING Our Homewood Suites by Hilton Portsmouth hotel is located one mile from Historic Downtown Portsmouth New Hampshire and close to several office buildings and industrial parks. Major nearby corporations include Pease International Tradeport Irving Oil Pan Am Services Portsmouth Navel Shipyard Newmarket International Liberty Mutual Tyco Lonza Sprague Energy Celestica Heidleberg Portsmouth Regional Hospital Botton Line Technologies University of New Hampshire NH Community Technical College Southern NH University Franklin Peirce College and Granite State College. Our Portsmouth Homewood Suites hotel features 16 two bedroom 48 one bedroom /separate living and sleeping areas/ and 44 studio suites. 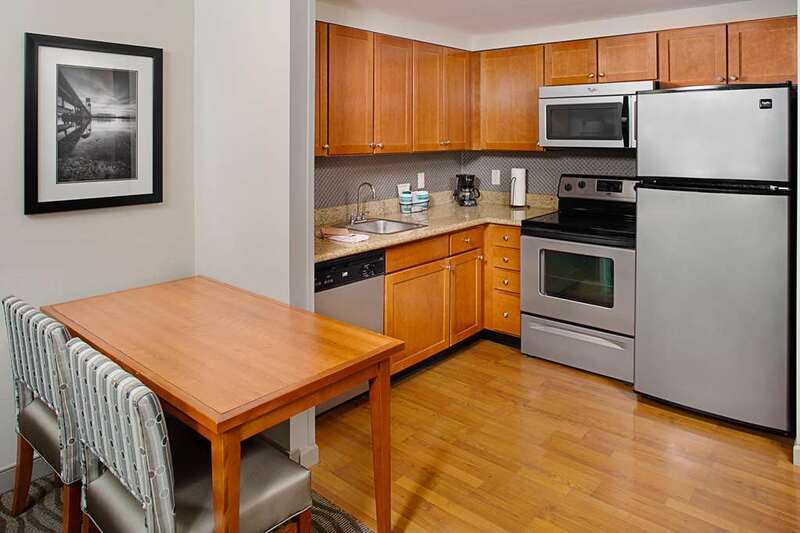 For comforts like home all suites come fully equipped with microwave oven full-size refrigerator dishwasher twin-burner stove coffeemaker utensils and place settings. The living and bedroom have remote controlled televisions with On Demand movies. The dining area can double as a workspace the suite also has a full-size sleeper sofa for extra sleeping space iron and ironing board two telephones with voicemail and data ports complimentary high-speed internet access custom designed alarm clock with back up alarm system MP3 Player capabilities and pre-set local radio stations. During your stay with Homewood Suites hotel in New Hampshire enjoy our complimentary Suite Start Breakfast daily Welcome Home reception Monday-Thursday evenings. Also complimentary at our hotel is a copy of USA Today delivered to your door Monday-Friday mornings exercise room sports court swimming pool 24-hour Suite Shop business center on-site guest laundry facility and complimentary grocery shopping service. Make Yourself at Home. The Gas Light: Three restaurants in one. Brick Oven Pizza in the basement Casual Dining on the main level Night Club on the third floor. Outside entertainment in the summer.